After a long day at work, I walk in the house and my stomach immediately starts growling. My first thought is too cook something quick that will fill me up, but I don’t want to sacrifice taste or eat something unhealthy. That’s why I love eating potatoes for dinner; they are nutritious, filling and taste delicious. Potatoes are low in fat, high in fiber and a key source of vitamins & nutrients. I know some will say potatoes have a lot of carbohydrates, and they do, but the majority of those carbs are complex, which helps keep you feeling full longer. Whipped Pecorino Idaho Potatoes comes together quick and is delicious paired with grilled sausage and sauteed fennel and onions. Warning....make extra...leftovers are delicious packed for lunch. Trim the fennel bulbs and cut into matchstick pieces. Pour the olive oil into a skillet and set it over medium-high heat. Add garlic and cook until fragrant, about 2 minutes. Add the onion slices and sauté until they are begin to wilt. Add the fennel and crushed red pepper flakes and cook until fennel begins to wilt. Clear a spot in the center of the pan, add the tomato paste and cook, stirring it in the spot for a good minute or more, until it begins to caramelize; then mix it in with everything else. Ladle 3 cups of boiling potato water from the pot into the skillet, stir well and bring to a boil. Adjust the heat to maintain an active simmer all over the pan. Continue to simmer the sauce until the flavors have developed and the fennel is soft but not mushy, 6 minutes or more. The sauce should not get too thick: stir in another cup or 2 of boiling potato water, if it reduces rapidly. When the sauce is done, taste and add salt if needed. Place potatoes in a large pot, add salted water, cover and bring to a boil. Cook until very soft, 20 to 30 minutes. When potatoes are soft, drain and return them to the pot to mash by hand or place them in a bowl of an electric mixer. Add salt to taste and the butter. Beat ingredients. Adjust seasonings and add the cream and pecorino cheese and beat again. Meanwhile, grill your sausage, about 10-15 minutes on each side. Plate the potatoes topped with fennel onion sauce and sausage. Sprinkle the dish with fennel fronds for serving. **note: this may seem like more water than you need but it gets used to make the sauce. I love all of the flavors you've combined - especially the fennel and the pecorino! Drooling! Boy does this sound good! Thanks for stopping by and sharing with us at #TryaBiteTuesday - pinned and shared!! I'm so into fennel...what a great way to incorporate with potatoes! I've never actually used fresh fennel before. Sounds good! My husband loves fennel, but I rarely cook with it. We'll be trying this recipe for sure! Love fresh fennel, and this recipe! Bring on the sausages! Ohh I want THAT! Sounds amazing! Whoa. I need that, like right now! Yay for Idaho potatoes! We are Idaho girls through and through, and we just can't enough of potatoes! My husband would be allll over this! This is some great comfort food and I bet it taste absolutely delicious! Yum, yum, yum! 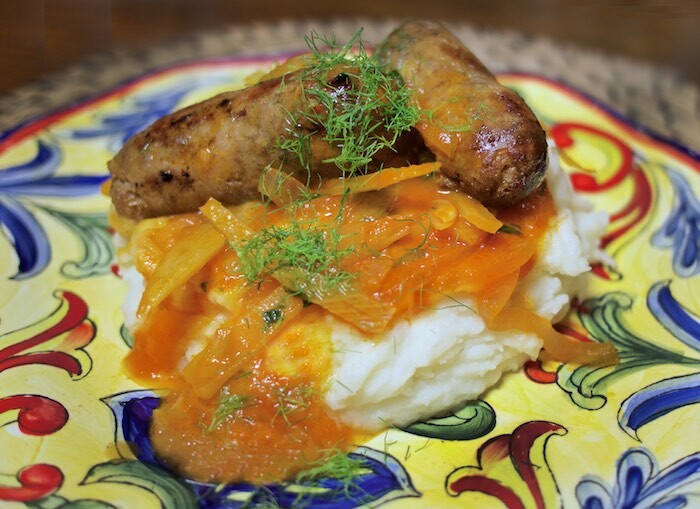 I love that you've added fennel into the mix and then served it over mashed potatoes! Right on! Oh, you got me good with this recipe, fennel is one of my weaknesses, love it!! I love fennel! This looks lovely. I don't use fennel enough in my cooking, but love the flavor. This is one I need to try! Looks great! This was so much fun! Sounds delicious! I love how the flavor of fennel really meshes with sausage. Super good! This looks so good! My husband is a meat and potatoes kind of guy and would love this for dinner! What a hearty meal! I love potatoes. The nutty nuances of the Pecorino is divine, I bet! Yum, I love fennel, it sounds wonderful with the sausages and potatoes! The pecorino is such a great addition. Never thought of that one before! Delicious meal, Love the mashed potatoes, their creaminess would be perfect with the sausage and fennel. In-credibly delicious. This is the kind of hearty meal that my guys would love! I have yet to cook fennel...this recipe looks fabulous and I am inspired to give it a try.